What is a thin file? A thin file is basically just that – the “file” or information on a particular individual is thin or rather, lacking sufficient credit history. Typically, this could mean that the individual is young, as they have not had enough time to build a true credit history or they are New-In-Country, without a US-based credit history. Thin files can also refer to under or unbanked individuals – those customers whose financial needs are not fully served by traditional financial institutions. A 2012 report by the World Bank showed that ¾ of the world’s poor do not have a bank account, “not only because of poverty, but also due to costs, travel distance and paperwork involved.” Under or unbanked individuals can also include minorities, older widows or divorcees whose credit histories link to their husbands’ name only, retirees without a mortgage, extremely wealthy individuals who pay cash for everything and people who deliberately do not use or want credit. 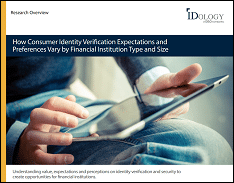 Many identity verification providers rely primarily on credit based information to confirm a potential customer is who they say they are. However, thin files have little-to-no credit history. Therefore, in many cases, these particular individuals will either be “failed” or escalated to manual review consequently incurring additional costs and potentially missing out on new revenue. Using non-credit based information has been proven to verify more identities while also reducing instances manual review. “[IDology offers] higher performance on thin file customers.” ~ Risk Manager, Medium Enterprise Banking Company. View the Validated Response here. As the under and unbanked market continues to expand, it becomes more important than ever to find new and innovative ways to verify your customers identity while also reducing fraud, increasing revenue, improving customer satisfaction and improving compliance.